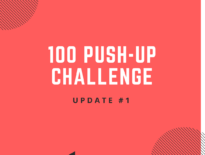 Welcome to update #2 of my journey to 100 push-ups series. On Sunday (8th October 2017) I finished program #2 of the 100 push-ups app. I’m not going to lie, compared to program #1, parts of this program were tough! Unlike last week where I only took a one day break I had to take a few more breaks this time around. All up, over the 6 days of the program I completed a total of 258 push-ups. My grand total push-ups performed to date (program 1 + program 2) is 388 push-ups. Thursday 28/09/17: Program 2 Day 1 (24 push-ups total). Saturday 30/09/17: Program 2 Day 2 (32 push-ups total). Monday 02/10/17: Program 2 Day 3 (42 push-ups total). Wednesday 04/10/17: Program 2 Day 4 (47 push-ups total). Friday 06/10/17: Program 2 Day 5 (53 push-ups total). Sunday 08/10/17: Program 2 Day 6 (60 push-ups total). Due to the high volume of push-ups per training day, especially the last 2 days, I had to complete some push-ups on my knees. This usually happened in the last two sets where I had already accumulated 30+ push-ups. Mid way into this program I decided to do a gymnastics conditioning class at my gym. Part of the warm up was 3 sets of 15 push-ups. I smashed out the first set of 15 push-ups in record time. I was genuinely surprised at how smoothly and easily I could do so many push-ups. My arms felt fatigued afterwards and the following two rounds were a struggle but I was happy with myself and I could start to see proof that this push-up program is working. My recovery time after each training day has significantly improved. When I first started this push-up challenge and was working my way through program 1 I would get sore triceps and pecs for a couple of days afterwards. This time there was no muscle soreness on the following day. I can now perform multiple reps of diamond push-ups. My current max reps in one set is 6. Previously I struggled to perform 2 in a row. Having completed so many push-ups up to this point I don’t find them as daunting as I first did before I started. This app and high volume method of training is sort of like the ‘grease the groove’ training system. You can read more about grease the groove here. Overall, I feel a little stronger all around and I’m slightly beginning to see some more definition in my arms and chest. I still have some way to go in building up a level of strength to be able to comfortably do 100 push-ups in a row but I feel that I’m on the right path. The plan is to now take a two-day break and start Program #3 on Wednesday 11/10/17. Stay tuned for my next update after I complete program 3.